There are a few images I can never seem to get enough of, and flowers are one of them. Don't you just love all the detail in this beautiful Carnation (item FBM_365) from Fred B. Mullett. The background was created using the Antiqued Glimmers from the 12/09 TJNL. My colors are Distress Ink Wild Honey and Glimmer Mist Sunflower. Once the background was dry, I stamped the Carnation in Black Archival, then colored with an H20 Brush and Peeled Paint and Barn Door Distress Inks. 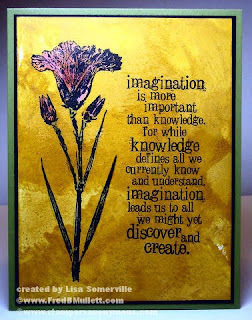 The sentiment is from the Tim Holtz Collection called Nature's Discovery. Lisa, this card is wonderful....I LOVE, LOVe, LOVE the background tech. Looks amazing. Great card! 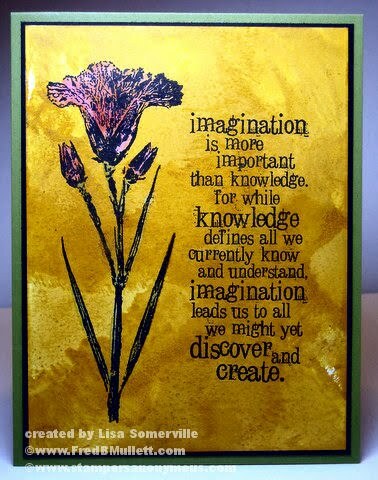 beautiful card, love the sentiment on that! What a gorgeous card. Beautiful background, beautiful flower, beautiful sentiment.